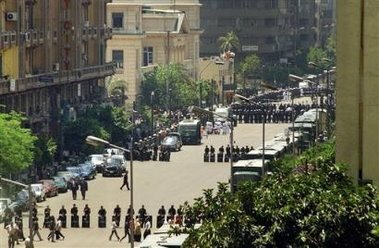 “The streets of downtown looked as if a foreign country had declared war on Egypt,” quipped a judge. Indeed, Thursday 11 May was even more brutal than Thursday, 27 April, as security forces deployed maximum and indiscriminate force to sunder the growing bonds between judges and public. 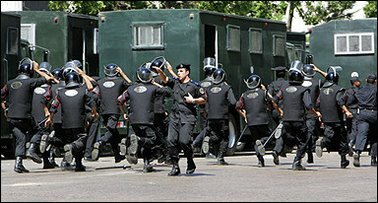 While the head of state was busy surveying Pharaonic artefacts in Berlin, security forces in Cairo were busy quashing peaceful demonstrators showing their support for judges. Journalists were not exempt from police brutality; al-Jazeera’s camera and sound crew and Associated Press reporter Nadia Abou El-Magd were roughed up by both uniformed and plainclothes police agents. And as per usual in the last few years, police officers did not exempt women from their violence. Kifaya has this harrowing account of what happened to al-Destour journalist Abir al-‘Askari, no stranger to police terror. 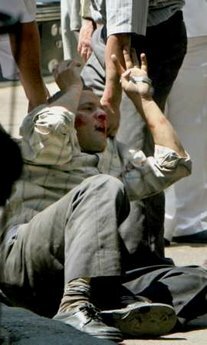 She was one of the many women assaulted on referendum day, 25 May 2005. Lives were lost yesterday. On its way to reinforce the already overwhelming security presence in downtown Cairo, a truck carrying CSF recruits overturned on 6 October bridge at Abbasiyya, killing 8-10 conscripts (reports vary) and injuring 20. Unlike 27 April, security forces occupied the inside of the High Court building and obstructed even workaday judges from reaching their courtrooms to adjudicate among ordinary litigants. On the orders of disciplinary tribunal head and Cassation Court president Fathi Khalifa, none but the two accused judges and seven members of their defence team were allowed entry into the courthouse. 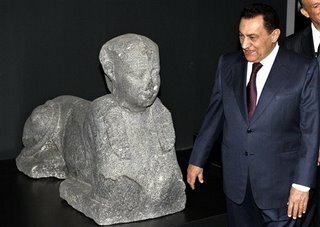 As Cassation Court justice and head of the defence committee Hossam al-Ghiryani went inside to negotiate with Khalifa, about 400 judges attending with accused judges Mekky and Bastawisi waited outside, rigorously separated from members of the public by elaborate phalanxes of CSF recruits. Khalifa refused to budge and the judges refused to comply. The hearing was adjourned yet again to 18 May. Judges returned to their Club for further deliberation, which culminated in a resolution to continue the weeks-long sit-in that has so perturbed the Mubarak regime. Two proposals were also floated: boycotting the hearing on 18 May until Fathi Khalifa recuses himself from the disciplinary board, and a more compromise proposal to attend but only under the condition that security forces evacuate from the courthouse. What is happening in Egypt today has caught the men of the regime off guard. They never anticipated the resolve of judges to follow through on their mission of ensuring clean elections. They never anticipated the persistence and depth of popular support for the judges. And they never imagined that indiscriminate and brute force would only reinforce the resolve of both judges and activist segments of the public. Most of all, they never thought that election-time mobilisation would continue well after elections were over. Sometimes, it is the simple but fatal mistake of miscalculation that is the undoing of the high and mighty. *Photos from AP, Reuters, AFP.